There are many archetypes of magic systems out there, and tons of variation to be found within each one if you look hard enough. To keep it broad, I have two simple questions: what do you like in a magic system, and what do you dislike in a magic system? Feel free to get specific with certain systems you like, or keep it general with specific elements like blood sacrifice or wand usage or whatever. Personally, I enjoy magic systems that operate more like a science than like, well, magic. I'm talking about the kinds that have very strict rules and guiding principles that cannot be violated. They tend to be pretty awesome because instead of magic battles being a power level game, in science-y systems they favor whoever is more creative and adaptive within the bounds of the system. A great example of strict rules magic systems that I love can be found in the Mistborn books by Brandon Sanderson. One thing I have grown to dislike immensely is the use of Latin or other real world languages being used as magical words for fantasy magic systems. This is especially annoying when the world doesn't even have a culture in present or historical times that could be a reasonable stand in for the real world country of origin. They could have come up with any mish-mash of cool sounding syllables to have an Elvish or whatever word for fire to use when throwing a fireball, but instead everyone seems to go for the ole standby of Latin. It gets really old seeing it used in so many places. I like magic systems that leave me lots of room for creativity, but still have enough definition to give them identity. The best example I can think of to describe what I mean would be the Death Note franchise. 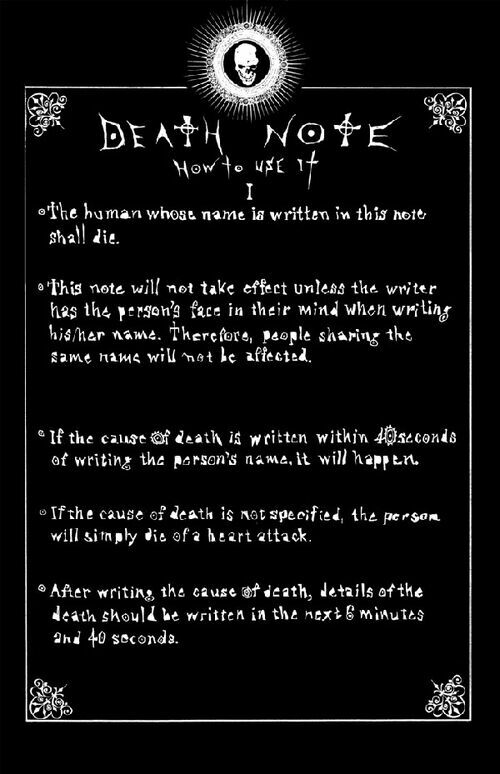 The Death Note arrives with some very basic rules, but throughout the series, the protagonist manages to work within these rules to still use the Note very creatively! This is the kind of freedom I like with a magic system. What I dislike are systems that have so many rules that there's no room for creativity at all; like ones where the creator has come up with a list of things that can be done with their magic system and I have to stay within that list in the use of it; sadface! Let me get creative! I also have a mild thing against element-based magic systems; in general they're just too trite for my taste. Come outside the box, people, it's fun. What I DO like is a magic system with inherent limits, be they the sort of spell you can cast, or how magic must be used, or better: both. Limitations make magic more interesting, in my eyes, and then, if you have a world where magic is inherently limited in what it can do, when you throw a curveball, it has MUCH more impact! The kingdom doesn't expect the bad person to summon an asteroid because magic involves equal blood sacrifice or a chant as large as the thing done? What happens when the asteroid hits? Suddenly you have a new plot to follow! How the heck did the big bad manage to do that? I have been known to do both although I am most often found in the middle as I don't like to constantly drag characters around and I am not passive enough to constantly take a back seat. Fantasy, Scifi, Future, Past/Medeival, Realistic role plays not centered around romance. Ones involving bands, sorry just not going to go there; teenage love story, I just don't find them that engaging; teen pregnancies, also just not going to go there; ya that is pretty much it. Personally I like magic systems that are very open and allow the players to come up with very creative uses for their abilities. The that being said I strongly dislike when players take complete advantage of that and make a completely over powered character that blasts their way out of every situation. So I would suppose that means I like it when there are definite limitations to the powers. For example lighting a campfire might be a piece of cake, but oh you want to rain fire and death down upon an enemy army, well that is going to cost a pint of your own blood, five minutes to build the power, and maybe your sanity if you mess up. To me magic is another form of energy, and like electricity a small current might just tickle a bit, but if you try and channel a bolt of lightning through your body it is not going to be pleasant.